Palin only wins 69% of Republicans in a head-to-head against incumbent Sen. Mark Begich (D). Photo courtesy of Corbis. Former Governor and Republican Vice Presidential nominee Sarah Palin continues to struggle with poor public perception, not just nationwide, but in her home-state as well, according to the latest survey from Democratic pollster PPP. 39% of Alaskan registered voters view Palin favorably, 58% view her unfavorably. And while 40% say they would vote to put Palin, who resigned her Governorship in 2009, back in office, 52% say they would support the current incumbent, Democratic Senator Mark Begich. On the surface, the numbers are pretty dim for the woman that once attracted a crowd of 60,000 to Florida in 2008, or who once caused reporters to stop mid-assignment due to multiple public flirtations with a 2012 presidential bid. But it's not all dreadful news for Palin-land, especially once you look beyond the 2014 general Senate election. What about that double-digit deficit against Mark Begich, you might ask? Again, it's all a matter of perspective, and when you consider that Palin trailed Begich 54-38% in February, 52-40% doesn't seem like as steep a hill to climb as it may otherwise have. So while Palin is still unpopular, and still trails the incumbent by double-digits, at least the trend lines look positive. Though that's not the best news PPP has for Palin. In their first 2014 Alaska Senate GOP primary survey to include Palin, PPP finds her in the lead by 10 points, outpacing the current sitting Lt. Governor and announced candidate Mead Treadwell, former Attorney General Dan Sullivan, and 2010 GOP Senate nominee and 2014 candidate Joe Miller, 36-26-15-12%. This puts the Democratic pollster in line with Republican firm Harper Polling, which found Palin leading the same crew of GOP candidates (except Dan Sullivan) in May, 32-30-14%. PPP also polled a variety of 3-way GOP primary matches, sadly none of which pitted Palin alone against the more Alaska Establishment friendly candidates Mead Treadwell and Dan Sullivan. I say 'sadly' because long-time Alaska political observer, unofficial Palin spokesman, and C4P contributor Ian Lazaran, seems rather convinced that in the unlikely event she enters the 2014 Senate race, Miller would bow out. Lazaran's assertions regarding Miller's status in the race in the event of a Palin bid are obviously mere assumptions, but assume he's right. Assume the Palin protege, whether out of a sense of obligation or necessity, did withdraw under such a scenario. What would a Palin vs. Treadwell vs. Sullivan primary look like? Miller performs pitifully across the board, but ekes out a net positive rating with just one group: very conservative GOP primary voters. In other words, that's his base (if you can call +9 a "base"). Palin's impressive +56 with this group of voters makes it more likely Miller supporters would turn to her over Sullivan or Treadwell, both of whom are popular with very conservative voters, but not as much so as Palin. "Are you more or less likely to vote for a candidate endorsed by Sarah Palin, or does it not make a difference?" Among primary voters who said they were MORE likely to vote for a candidate endorsed by Palin (26%), protege Joe Miller defeated Murkowski 82-18%. Among voters who said they were LESS likely to vote for a candidate endorsed by Palin (35%), Murkowski won 81-19%. I'm clearly assuming an entire series of events that have not yet occurred, and may never. But if Miller sits the race out, and all his supporters head to the polls on primary day 2014 anyway, the race could wind up looking like the scenarios above. One final word on an interesting finding from PPP. Incumbent Senator Mark Begich (D) is surprisingly strong with Alaska Republicans, peeling off 20% of them in a head-to-head against Sarah Palin, while limiting the former Governor to an unimpressive 69% of her own party. By comparison, Sen. Begich secures 93% of his own party, while only 6% of Democratic respondents said they'd support Palin. If PPP's finding holds, it would represent a departure from past Republicans' performance statewide against Democrats, at least based on the limited exit poll data we have available out of Alaska. According to 2008 exits (none were taken in 2012), John McCain carried 93% of Republicans, to Barack Obama's 6%. Sen. Ted Stevens (R) won 77% of Republicans, to Mark Begich's 18%. And Congressman-At-Large Don Young (R) won 77% of Republicans, while Democrat Ethan Berkowitz carried 17%. Suppose that as the 2014 campaign season heats up, Republicans rally, and return home to Palin, at least to the extent they did with Ted Stevens and Don Young in 2008. What would the PPP result have looked like in that event? So Gov. Chris Christie, fmr. VP nominee Paul Ryan, and President Bush's brother Jeb are all essentially tied with Hillary Clinton. Marco Rubio is within the margin of error, and Rand Paul is within 10 points of her. What's going on here? I thought Hillary was unstoppable, poised to not only win by double digits in the general election against all of her potential opponents, but poised to start picking off traditionally red states in a fashion not seen since the '84 Reagan landslide. Marist was the last non-PPP pollster to survey the 2016 Presidential race, and they did NOT find any of the Republican candidates tied with Clinton. Christie only managed 41% to Clinton's 47%. And it only gets worse from there for the rest. Paul Ryan, who trailed Hillary Clinton by just two points in the PPP poll, finds himself a whopping 16 points behind the Democratic frontrunner. Jeb Bush trailed Hillary by a 8 points (as opposed to 3 points in the PPP poll), and Rubio, Paul, and Perry were all down double digits. Quinnipiac found similar results in late June and May, with Christie down 6 to Clinton, Bush down 8, and Paul down double-digits. 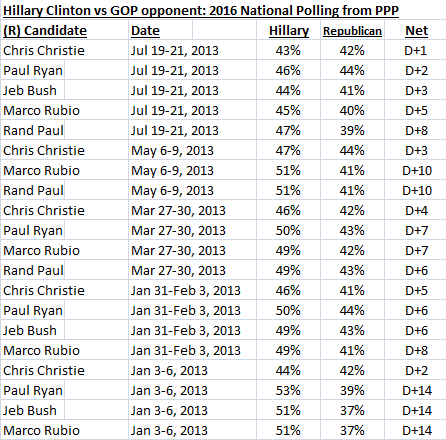 And as far back as March, Quinnipiac had Clinton ahead of Christie by 8, Ryan by 12, and Rubio by 16. So as you can see, the recent PPP numbers represent quite a shift from the start of the year. Pulling back the curtains on the poll results, we see some interesting racial splits among various 2016 match-ups. For example, NONE of the GOP candidates perform as well with white voters as Romney did in 2012, when he defeated Obama 59-39%. In fact, only Chris Christie and Paul Ryan manage to win whites by double digits against Hillary (by 12 and 11 points, respectively), lending credence to the notion advanced by some that Republicans will have trouble repeating their 2012 performance with white voters against a Democrat who is not an African American. Also notable is the fact that Hillary Clinton is able to keep Rand Paul limited to a 6 point advantage (46-40%) among white voters. President Clinton stands apart from Presidents Bush and Obama in that his job approval rating varied widely from his favorability ratings at times during his presidency. Bush and Obama have seen no such variation. About a month ago, Gallup released a survey on former President George W. Bush that received a surprising amount of attention - for the first time since April 2005, before Hurricane Katrina turned his personal popularity upside down for the remainder of his presidency, the once deeply unpopular former President saw his favorable rating surpass his unfavorable rating (49/46%). Notable not only for the incredible duration of his unpopularity, his most recent Gallup standing represents a 31 POINT shift in Bush's net favorable/unfavorable rating since shortly after leaving office, when he clocked in at a dismal 35/63%. So there you have it. A man who was disliked by super-majorities just four years ago now finds public opinion split on the subject. And while his rating is lower than both the current President's (who last found himself at 55/43% in a Gallup survey), and his predecessor's (who was at 69/27% last August), it's still a bit hard for this political junkie to fathom the guy that even Republicans had lost faith in could possibly be viewed favorably by a near majority of the country. But lets not make more of this survey than it actually is, as several mostly conservative pundits and bloggers did by claiming the results confirmed George W. Bush was somehow more popular than Barack Obama. Where did conservatives go wrong in making this assertion? They made the mistake of merging the meaning of favorability with job approval by assuming that Obama's 47/44% job rating (as reported by the Gallup daily tracker on June 11th, the day the Bush favorability poll was released) was the same thing as Bush's favorability rating (as measured June 1-4, 2013). Asking a voter whether they view an individual favorably or unfavorably is different in both language and meaning than asking a voter if they approve or disapprove of the job someone is doing. For example, President Obama's most recent favorability rating, as measured by Gallup in April of this year, put him at a fairly strong 55/43%. The Gallup daily tracking poll taken at the same time put his job approval rating, however, at a less impressive 48/46%. 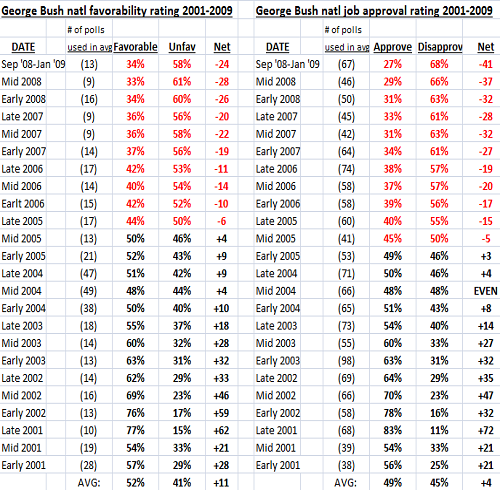 George W. Bush left office with a poor 40/59% favorability rating, but an even worse 34/61% job approval rating. Gallup's final survey of President Clinton's favorability, while still in office, was December 2-4, 2000, and found him at an impressive 57/41%. But Americans were even more fond of the job Clinton was doing as President than they were of him personally, with 60% expressing approval, and 35% expressing disapproval. 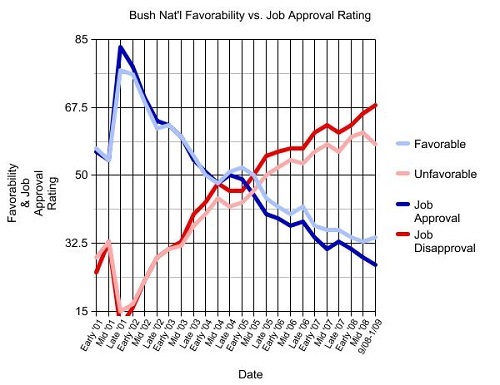 So a few bloggers got it wrong in asserting that Bush is now more popular than Obama, as job approval is not precisely predictive of favorability. But "precisely" is the operative word there. 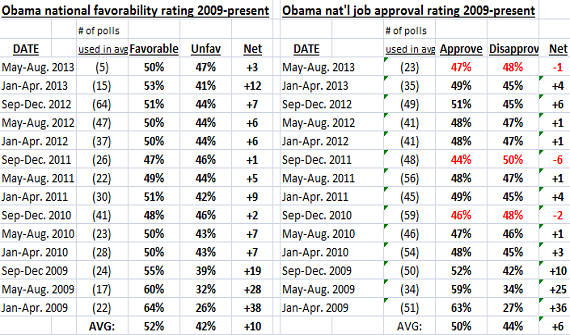 A close comparison of the entirety of polling on the favorability and job approval ratings of the last three Presidents illustrates that while favorability and job approval ratings are not mirror images of one another, they travel in fairly close lock-step, with only one exception: Bill Clinton from 1998-2000. Data includes 410 favorability surveys taken from January 20, 2009-present, and 645 job approval surveys, compiled from Polling Report, Real Clear Politics, and TPM Poll Tracker. 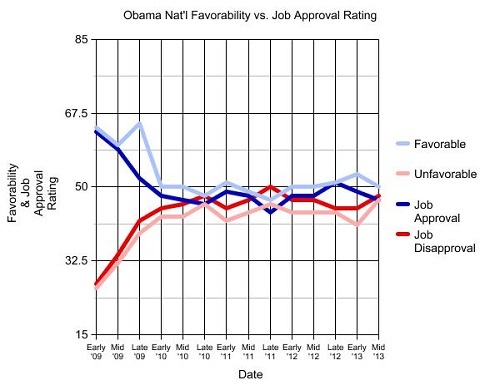 With the exception of the first year of his Presidency, Barack Obama's job approval/disapproval and favorable/unfavorable ratings have rarely deviated from the 50% level. And while George W. Bush's overall trends were much different than Obama's, the pattern of favorability rating tracking closely to job approval was even more apparent throughout his 8 year presidency. 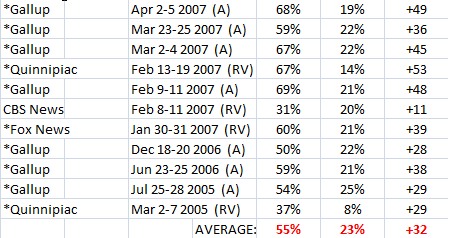 See the tables and charts below of his ratings, averaged into 4 month increments. Data includes 485 favorability surveys taken from January 20, 2001-January 20, 2009, and 1,428 job approval surveys, compiled from Polling Report and Real Clear Politics. The new Virginia Quinnipiac poll released this morning holds one troubling bit of information for Democrats: the next election could be a disaster at the presidential level, that is, if they're unfortunate enough to wind up with Chris Christie as their opponent, and Joe Biden as their nominee. The Virginia survey finds Gov. Chris Christie defeating Vice President Joe Biden in a hypothetical presidential race by 8 points, or 46-38%. That's awfully reminiscent of the 2004 presidential result, but a far cry from the 6 and 4 point victories for Barack Obama in '08 and '12. In fact, if Christie's 8 point margin over Biden were to hold until election day, it would represent a net 12 point shift in the Republicans favor since the 2012 Presidential election. 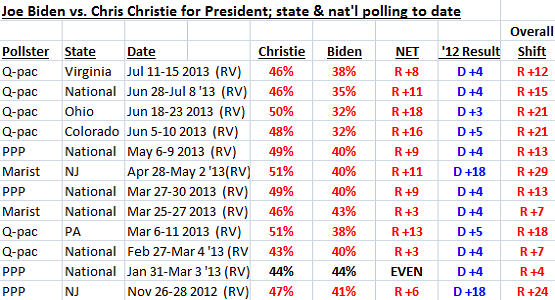 In 11 of the 12 state and national polls, Chris Christie leads Joe Biden, frequently by significant margins. Consider the spate of state polls released by Quinnipiac this year. A handful of purple swing-states turn SOLID red when respondents are asked to choose between Christie and Biden in a hypothetical 2016 race. Though it may sound surprising, the two men in the middle averaged higher favorability ratings with Republicans in the run-up to their primary runs than Chris Christie has averaged so far this year. But George W. Bush leaves all three far behind in terms of pre-primary adoration from their own party. New Jersey Governor Chris Christie has managed to shock political junkies with an unparalleled bipartisan allure in an intensely divisive era. That appeal became apparent in the immediate aftermath of Hurricane Sandy in October 2012, and was recently reinforced by a new national Gallup poll showing Christie with a double-digit net positive favorability rating among Republicans (+35), Independents (+30), AND DEMOCRATS (+34)! If you buy the Gallup numbers, Christie is in fine shape with his own party, contrary to some of the more vocal personalities on the Right. That's even more surprising after taking a step back to examine what has transpired between the New Jersey Governor and his national political base over the last several months - the Obama/Sandy embrace days before Mitt Romney was defeated at the ballot box, the aggressive press conference ripping House Republicans for allegedly playing politics with the Sandy relief bill, culminating in a seemingly self-serving snub at Senate Republicans regarding the timing of an upcoming special Senate contest. (*) denotes survey data comes from a Republican sub-sample. 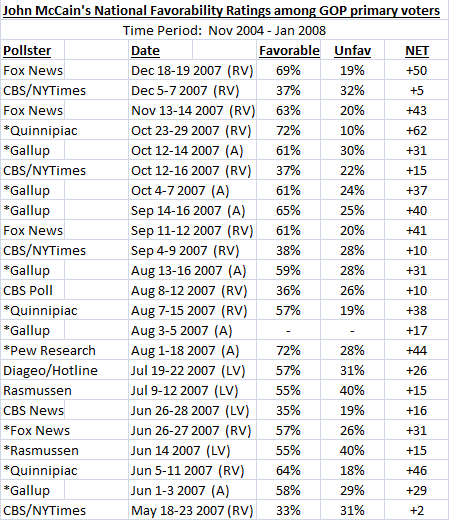 Polls without (*) are of GOP primary voters. Data compiled from Huffington Post Pollster, Polling Report, and Argo Journal. 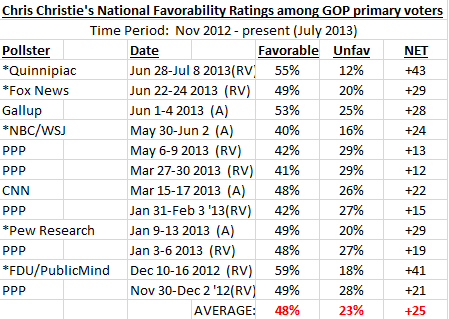 To date, Christie has managed a net 25 point favorability rating among Republicans nation wide, at least based on the somewhat limited pool of data we have available since the 2012 election. That's good enough to win a GOP presidential nomination, right? Maybe. But for what it's worth, BOTH of the Republican party's last two presidential nominees had higher pre-primary favorability ratings within their own party than Chris Christie does today; a fact that really comes into focus when you recall the last two nominees were noted squishy 'RINOS' John McCain and Mitt Romney. Consider Senator John McCain, who wrapped up his party's nomination in March 2008, just two months after it began, and defeated runners-up Mitt Romney and Mike Huckabee by an impressive 47-22-20%. On the eve of the Iowa Caucus (which he lost handily), McCain had averaged a 55/23% fav/unfav rating with Republicans since the 2004 election. (*) denotes survey data comes from a Republican sub-sample. 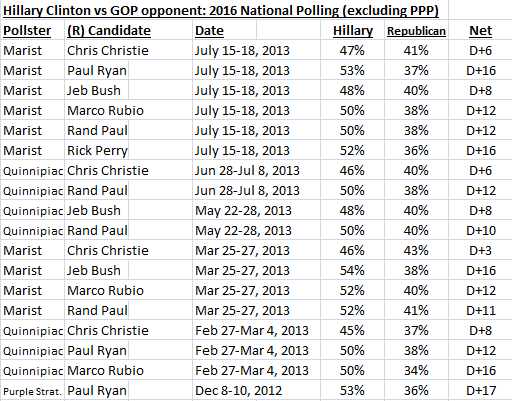 Polls without (*) are of GOP primary voters. Data compiled from Huffington Post Pollster, Polling Report, and Real Clear Politics. While McCain's average unfavorable rating was identical to Christie's today, his favorable rating with Republicans was 7 points higher (55 vs. 48%). And by the time McCain actually won his first primary contest, a staggering 75% of New Hampshire primary voters viewed him favorably. PART III: The "Race" Factor: Have African Americans Forgiven the Clintons for 2008? Clinton greets supporter and BET founder Robert L. Johnson at a campaign stop in Jan. 2008. Photo courtesy of Todd Heisler/The New York Times. As discussed in parts I and II of this 3 part series, Hillary Clinton would be a uniquely strong Democratic Presidential Primary candidate should she decide to enter the race in 2016, though with three distinct areas of potential weakness, based on her 2008 performance against President Obama. She runs the risk of falling behind among voters concerned with electing a candidate who can best bring about change, with the only variable being how many 2016 primary voters will choose this quality as the most desirable trait. 51% selected "change" in 2008, far more than the second most identified trait, "experience," at 23%. Clinton also risks doing poorly among young voters aged 18-29. This age group chose Barack Obama over Hillary Clinton in 2008 by 26 points, and although she won voters over 30 years old by four points, (86% of the total electorate), she still lost the nomination. But of all the attributes and demographics measured by the 2008 primary exit pollsters, none would seem to bode so poorly for Hillary Clinton in 2016 as her performance among African American Democratic Primary voters. By the time the campaign ended in June 2008, Hillary had averaged a measly 15% of the African American vote, to Barack Obama's 76%. The margin was large enough to deny Clinton the nomination, despite carrying white Democratic primary voters 55-39%, Hispanics 62-35%, and "other" 57-41%. Data is compiled from CNN's state-by-state primary exit polling. The complete data behind the national primary numbers can be found here. Sure, a part of Hillary's weakness with black voters in 2008 was due to the presence of a young, charismatic African American on the Democratic ballot. But if you recall, the Clintons did a fair amount of racial flame-throwing in their quest to shake-off the popular Senator, upsetting many former black allies and supporters. So the question is whether or not African Americans have forgiven the Clintons for the perceived racial undertones of their attacks on Obama, and if so, whether they've redeemed themselves to the point of receiving their vote. Only surveys including racial breakdowns were included in the table. A variety of young or new faces seem capable of exploiting Hillary's 2008 weakness with young Democratic primary voters. From left, TX Rep. Joaquin Castro, Newark Mayor Cory Booker, Hillary Clinton, San Antonio Julian Castro, and newly-elected Sen. Elizabeth Warren. Though Hillary Clinton caught a bit of bad press recently regarding her national favorability rating, her continued strength as a Democratic primary contender remains unfazed by the factors that caused her popularity to take a slight dip last month, at least according to public polling on the matter. The most recent survey on the race shows Clinton leading all of her likely Democratic opponents AND undecideds by a miraculous 63-37%, besting her closest competitor Joe Biden by 50 points! It may all sound a bit like deja vu, until you realize that Hillary is out-distancing her potential 2016 competitors by a far greater margin than she ever did in 2008. Her 2016 polling averages are strong among the groups she's been historically strong with (whites, Hispanics, and women), as well as the groups she performed poorly with in 2008 (blacks, men, 'very liberal' voters). But there was another group, besides the "change voters" discussed in Part I of this series, that were particularly down on Hillary during her battle with Barack Obama: 18-29 year olds. And if 2008 is any guide, Hillary will want to do some serious advance work on nailing down the youth vote, strong early polling aside. Despite recent chatter in some conservative circles proposing preemptive attacks on Hillary Clinton's age in preparation for 2016, advanced age in and of itself is certainly no bar to a party's nomination (for recent examples, see Bob Dole and John McCain), nor even the the presidency (see Ronald Reagan). But when you couple that advanced age with a historical weakness among young voters, you can see why Hillary may need to be creative with ways to reach out to this increasingly influential Democratic voting block. What do I mean by Hillary Clinton's "weakness with young voters"? I mean that she lost 18-29 year-olds in 2008 to Barack Obama by a significant 60-34%. I also mean that she won 18-29 year olds in just 5 of 40 contests where exit polling was conducted (Arkansas, Florida, Kentucky, Massachusetts, and West Virginia). Moreover, as the chart below indicates, she lost the next youngest age group, 30-44 year olds, to Obama by a hefty 13 points (54-41%). Exit Poll Data compiled from CNN. National figures were compiled from state-by-state exit polling, the results of which can be found here. In 2008, the Clinton juggernaut collapsed before a comparatively unknown, three-year Senator from Illinios, in part because the big-wigs in Hillaryland failed to anticipate the degree to which members of their own party wanted a candidate who represented that exhausted political buzzword: "change." It's not that Mark Penn, Patti Solis Doyle, Howard Wolfson, and other 2008 Clinton campaign verterans were idiots - they knew something about how to run a political campaign, and were certainly well aware that after 2.5 years of a historically unpopular President George W. Bush, Americans at the national level would be craving change. But what were the odds that Democrats would turn those same desires against their own darling Clinton? After all, it was the Clinton family that ushered the Democrats out of the political wilderness of the 1980s. It was the Clintons who became the first Democrats to win two presidential terms since FDR. It was the Clintons that presided over the greatest peacetime economic expansion in history. Yet still, in the Winter and Spring of 2008, Democrats simply weren't buying what the Clintons were selling anymore; this wasn't an "experience" election, and Hillary was NOT the candidate of change. Whether through miscalculation on her campaign's part, or simply her opponent's own strength, Clinton performed very, very poorly among voters in her party who said they wanted a candidate that could best "bring about change," which, unfortunately for Hillary, wound up being the majority of the Democratic electorate that year. Flash forward five years, and Hillary Clinton again leads the primary, though this time sweeping nearly every subset of every subgroup of potential Democratic primary voters. Which begs the question: is 2016 the next 2008? Will the next Democratic Presidential primary, or even the next general election, feature a "change" component to the extent seen in 2008? It's hard to say, and there are some obvious differences. In 2016, it will be Hillary's party that has dominated the White House for 8 years, which could end up a net negative OR positive for her campaign, depending on how Americans continue to perceive the job President Barack Obama is doing (which, as of today, isn't too well). Yet if the national mood is such that a party of Obama-Democrats jump on the "change" bandwagon once more, Hillary Clinton has a major soft spot for opponents to target, especially if 2008 is any guide. Data is compiled from CNN's state-by-state exit polling. I compiled the national data from CNN state exit polling. That process can be found here. The difference in Obama and Clinton's vote margins among people who identified the ability to "bring about change" as the most important candidate quality, and those who did not, is stark. Obama carried the "change" voters by a landslide 41 points (68-27%), while Hillary carried the rest (voters who said experience, electability, or empathy for others was the most important candidate quality) by an identical 41 points, or 63-22%.